Adrian Fielder, assistant dean of instruction at Colorado Mountain College Spring Valley at Glenwood Springs, fuels up at the college’s electric vehicle charging station at CMC Carbondale. 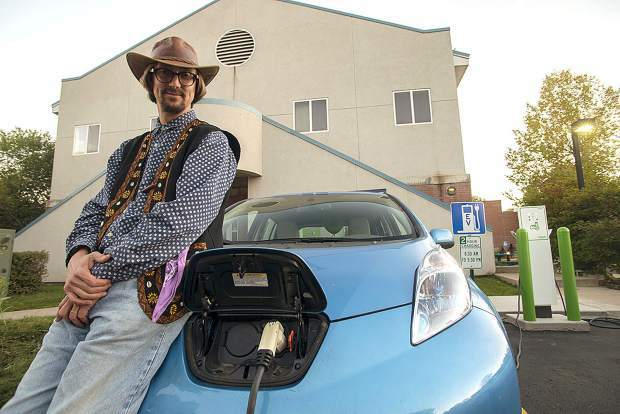 The college has 10 charging stations paid for through a grant from the Colorado Energy Office. This collaboration was among those that recently earned the college an honorable mention in the 2018 Higher Education Climate Leadership Awards. For its collaborative work on electric cars, wildlife surveys and a broad range of other efforts that address climate change, Colorado Mountain College recently earned national recognition. In January, the U.S. Green Building Council and Second Nature honored the college as one of eight U.S. institutions receiving the 2018 Higher Education Climate Leadership Awards. CMC’s award, an honorable mention, is for cross-sector collaboration. It recognizes the college’s students, faculty and administration for partnering with many other organizations to reduce greenhouse gas emissions, monitor changes in climate and support land preservation. Collaborative efforts cited for the award include working with the Colorado Energy Office to install electric car charging stations at 10 CMC locations, strategizing with community and utility leaders to accelerate renewable energy, and using student scientists to help land and climate organizations create biological baselines. For example, students in the Roaring Fork Valley are monitoring soil moisture content at stations throughout the valley to provide valuable data for the Aspen Global Change Institute, said Adrian Fielder, assistant dean of instruction at CMC Spring Valley. In another project, students and faculty are working with the Colorado Natural Heritage Program to conduct a “bio-blitz” survey, documenting plant and animal life in and near the Spring Valley campus and setting a biological baseline. In Aspen, students and faculty are working with The Farm Collaborative at Cozy Point Ranch to create a demonstration farm, tool library and incubator space for food entrepreneurs, with the aim of building local food resilience as the climate changes. CMC’s Bachelor of Arts in sustainability studies program hosts annual conferences open to students and invited members of the public. The conferences feature workshops on efforts to develop clean energy jobs, reduce greenhouse gas emissions and adapt to the changing climate. CMC is an active member of the Association for the Advancement of Sustainability in Higher Education, a national organization for college-level climate and sustainability programs. The association’s resources help keep CMC’s faculty and staff on the leading edge of sustainability education. These and many other examples of cross-sector collaboration were included in CMC’s successful award application, written by Dr. Kevin Hillmer-Pegram, associate professor of sustainability studies at Spring Valley, and Ed Chusid, CMC grant coordinator. “Recognition for cross-sector collaboration is an honor and truly symbolic of our sustainability successes here at the college,” said Nathan Stewart, chair of the college’s sustainability studies bachelor’s program and associate professor at CMC Steamboat Springs. CMC offered examples of its work in all three sectors. For the U.S. Green Building Council and Second Nature, CMC’s collaborative work stood out. “Combining the expertise of higher education institutions with businesses, cities, states and other stakeholders creates climate solutions at the scale needed to meet today’s environmental challenges,” said Betsy Painter, communications manager for Second Nature. Award winners will be recognized at the 2019 Higher Education Climate Leadership Summit later this month in Tempe, Arizona. Heather McGregor is a communications professional and former newspaper editor who occasionally writes about CMC programs for the college’s public information office.